In space where there is nothing visible there is a source of gravity. 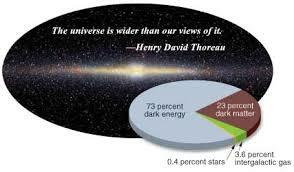 Scientists call it dark matter. It is the theory that there is matter there it is just invisible and nearly undetectable. A billion sub-atomic particles of dark matter pass through your outstretched hand every second, in fact 95% of the universe is dark matter/energy. Also as the universe expands so does dark matter. In Canada the biggest dark matter detector is currently being built in search of the Anti Social WIMPs (weakly interacting massive particles) Dark Matter. DEAP ( Dark matter Experiment using Argon Pulse-shape discrimination) is on the hunt for these WIMPs using the nuclei of argon atoms to collide into suspected dark matter. On the other side of the world , France and Switzerland, they are using the LHC (Large Hadron Collider) in CERN ( Counseil Européen pour la Recherche Nucléarire) to do the same thing as DEAP. However, there is another technique used to detect dark matter: photons. If you smash photons into an area suspected to contain dark matter it will glow if there is any there!